Players typically suffer a letdown after winning their first Grand Slam title. It's only natural to relax after achieving a lifelong goal, plus it takes time to adjust to the demands of fame. The slump can last months or years. The 21-year-old Japanese phenom won her second consecutive Grand Slam title today, topping Petra Kvitova 7-6 (2), 5-7, 6-4 in the Australian Open in Melbourne. Osaka, seeded fourth, failed to convert three championship points with Kvitova, seeded eighth, serving at 5-3 in the second set of their first career meeting. But Osaka recovered to break serve for 2-1 in the third set and held on to triumph after 2 hours, 27 minutes. "Sorry, public speaking isn't my strong point, so I hope I can get through this," Osaka, seeded fourth, told the crowd after receiving the trophy. "I wouldn't have wanted this to be out first match, but huge congratulations to you (Kvitova) and your team. You are amazing, and I am honored to have played you in a Grand Slam final." Osaka, coached by Sascha Bajin, became the first woman since Jennifer Capriati in 2001 to win her first two Grand Slam finals and the first to win two consecutive majors since Serena Williams in 2014-15. On Monday, Osaka will become the first Japanese player, man or woman, to climb to No. 1 and the youngest woman to do so since Caroline Wozniacki at 20 in 2010. Born in Japan to a Haitian father and Japanese mother, Osaka has lived in the United States since she was 3. Her 22-year-old sister, Mari, is ranked No. 324. They learned tennis from their father, Leonard Francois, who was inspired after watching the Williams sisters play in the 1999 French Open. 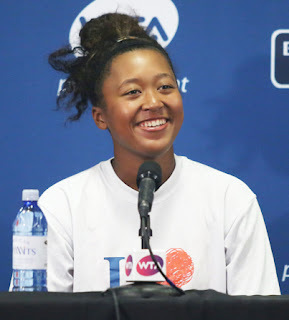 Osaka made her WTA main-draw debut in the 2014 Bank of the West Classic at Stanford. As a 16-year-old qualifier in the tournament, she saved a match point and ousted 2011 U.S. Open champion Samantha Stosur in the first round before losing to eighth-seeded Andrea Petkovic. Kvitova, a 28-year-old left-hander, played in her first Grand Slam final since winning Wimbledon in 2014 for her second title there. She suffered career-threatening cuts to her left hand in a December 2016 knife attack at her home in the Czech Republic and missed more than four months. "It's crazy," said Kvitova, who will match her career high of No. 2 and would have become the oldest first-time world No. 1 with a victory. "I can't believe I have just played in the final of a Grand Slam again. It was a great final. Well done, Naomi — to her team as well. You really played well. Congratulations for being world No. 1 as well." Kvitova reached the quarterfinals of the 2017 Bank of the West Classic in her only Northern California appearance. The tournament moved to San Jose last year as the Mubadala Silicon Valley Classic. In today's mixed doubles final, third-seeded Barbora Krejcikova of the Czech Republic and Rajeev Ram of Carmel, Ind., beat Australian wild cards Astra Sharma and John-Patrick Smith 7-6 (3), 6-1. Top-ranked Novak Djokovic will face second-seeded Rafael Nadal for the men's singles title on Sunday at 12:30 a.m. California time (ESPN) in rematch of their epic 2012 Australian Open final, which Djokovic won 5-7, 6-4, 6-2, 6-7 (5), 7-5. At 5 hours, 53 minutes, it remains the longest Grand Slam title match in history. Djokovic is 27-25 overall and 3-4 in major finals against Nadal, The 2012 marathon is their only meeting in an Australian Open final. Nadal has won 17 Grand Slam singles titles, second behind Roger Federer's 20. Djokovic has captured 14, including the last two, to tie his idol, Pete Sampras, for third place. Six of Djokovic's crowns have come in the Australian Open, a record he shares with Roger Federer and Roy Emerson. Nadal is 1-3 in Australian Open finals, having won in 2009 and lost in 2012, 2014 and 2017.